Rsvp strives to offer quality kitchen products and cooking tools at competitive prices. 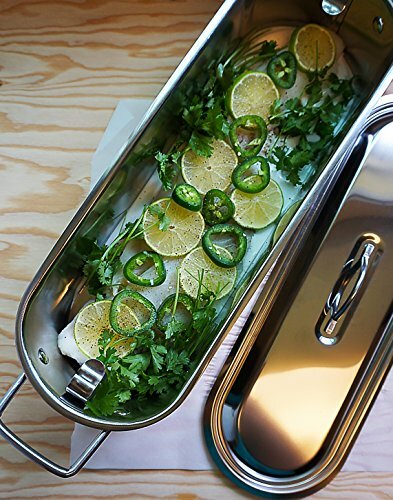 Our RSVP endurance stainless steel fish poacher is a perfect example. This versatile, large fish poacher pan is made from commercial quality stainless steel. With this fabulous poacher, you will get tender, flavorful, and healthy results each time you use it. Prepare an elegant meal of whole Salmon, snapper, or striped bass, just to name a few, or cook vegetables with a fish steak or fillets, and serve over hot rice. The poacher allows for attractive, healthy meals that are quick, easy and delicious. Constructed of durable stainless steel, it can be used in the oven or across two burners on the stove top. The removable inner Rack's long handles make it easy to lift out cooked dish without is flaking apart. Measures 18-inches in length by 7-inches wide by 4-1/2-inches tall. Dishwasher safe for easy cleaning. When all the right people, and ingredients, kitchen tools, and food come together, we call this the art of gathering. GREAT FOR THE KITCHEN: The removable inner rack's long handles make it easy to lift out cooked dish without is flaking apart. PERFECTLY POACHED: Prepare an elegant meal of whole salmon, snapper, or striped bass, or cook vegetables with a fish steak or fillets, and serve over hot rice. PERFECTLY SIZED: Measures 18 inches in length by 7 inches wide by 4.5 inches tall. FANTASTIC QUALITY: Large fish poacher pan is made from commercial quality stainless steel. EASY TO USE AND CLEAN: Dishwasher safe for quick and easy clean up.